In December my husband and business partner Bill had to undergo three surgical procedures associated with sinus problems. One of the procedures was to remove and biopsy a lymph node on his neck to rule out Lymphoma. We went through a similar set of surgeries and anxieties seven years ago. Although Lymphoma was happily ruled out then and again in December, the same surgeon told us the first time that because of Bill’s sinuses that they would be seeing a lot of each other for the rest of their lives. This time it was also different because I had become a mom. Our 7-year-old daughter would be watching how I handled this. I needed to act calm and relaxed about the surgery even though I wasn’t. I was also aware of how lucky we are to have good health insurance and live in a major metropolitan area with access to cutting-edge medical technology of which Bill had been a recipient. This doctor has given Bill such consistently prompt and outstanding care and I wanted to express my gratitude. And frankly I needed to have a good laugh. So we decided to take some of the leftover dough from our gingerbread house baking and bake some Gingerbread Patients for the staff at the doctor’s office. Our daughter placed the currants in the traditional locations while I used Royal Icing to replicate the “Mustache Dressing” bandages that are placed under the nose after surgery and the bandages that had covered the incision used to remove the lymph node. I’m sure that the office staff enjoyed the treats but mostly our family was so glad to have a laugh making these and carrying a tray of them through the hospital. 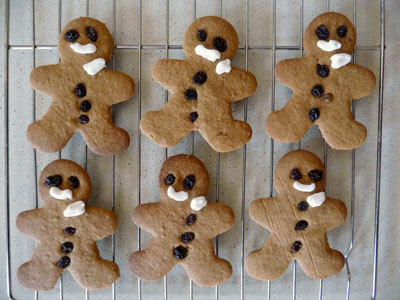 I never imagined how a gingerbread man could transform my day. You have an uncanny ability to look real life straight in the face and find a sense of humor about coping. You have a mix of creativity and practicality that hits home. Bravo!!!! !